At the H1 chart of the EUR/USD currency pair we have “head & shoulders” reversal pattern forming with the target in the area of 1.3732. One should consider increasing the amount of long positions after the price breaks the resistance level in the area of 1.3555. The stop must be placed below 1.3415. 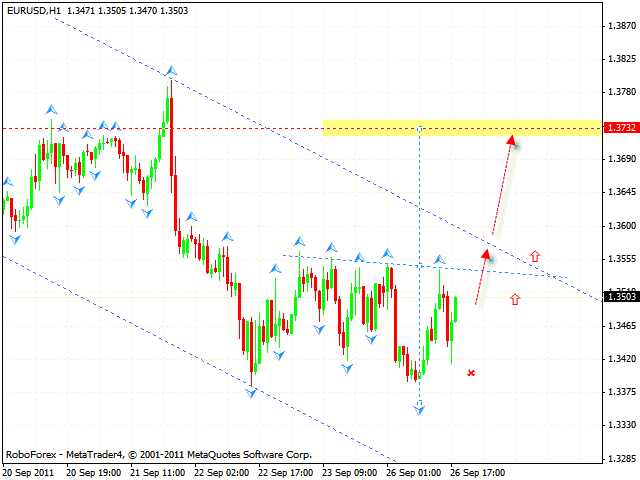 But if the price reaches a new minimum in the area of 1.3360, this case scenario will be cancelled. 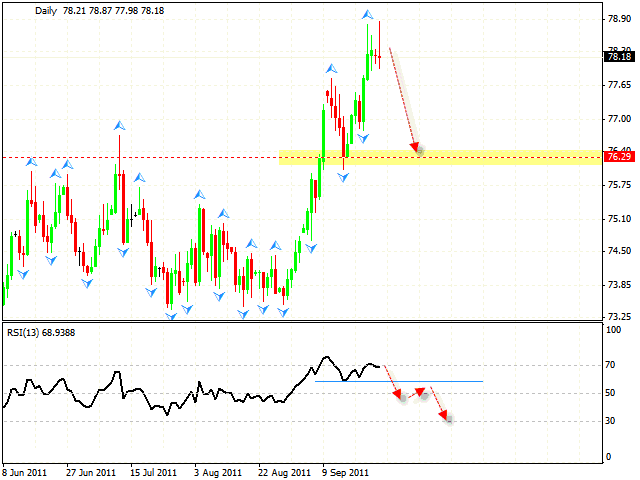 At the daily chart of Dollar Index we have “failure swing” reversal pattern forming at the RSI. The target of the fall is the area of 76.29. 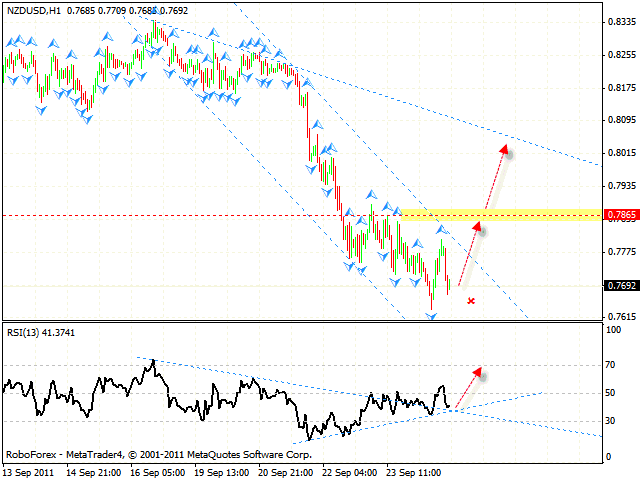 After the price breaks the support level at the RSI we should expect the start of the descending movement. But if the price reaches a new maximum in the area of 78.90, this case scenario will be cancelled. New Zealand Dollar has reached the targets of the descending pattern. Currently we should expect the test of the level of 0.7865. The price testing the trend’s rising line (which is a support line here) at the RSI is a signal to buy the pair. The second target is the test of the trend’s descending line at the price chart, as the similar line at the RSI has been already broken. But if the price falls lower than 0.7620, this case scenario will be cancelled. 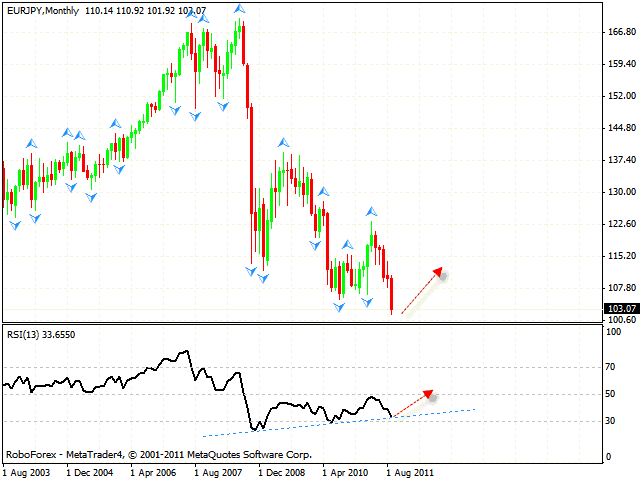 At the monthly chart of the EUR/JPY currency pair the price was supported by the trend’s rising line at the RSI. We should expect the price to rebound from it and start moving upwards. The closest target of the growth is the area of 115.20. But if the RSI indicator falls lower than 30, this case scenario will be cancelled. The daily chart of the pair also indicates a possibility of the rising movement. All targets of the descending pattern have been reached, we should expect the test of the descending channel’s upper border. 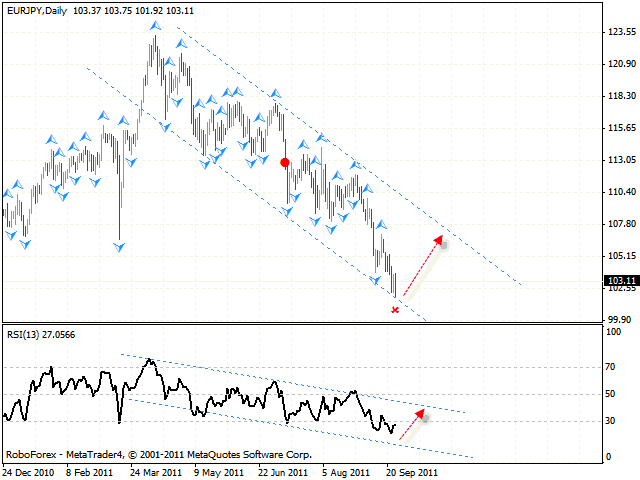 If the price succeeds in breaking the trend’s descending line at the RSI, the next target will be the level of 110.40.